On the debut . . . Sam Rosenthal’s subtle electronics and introspective lyrics establish black tape for a blue girl’s stature beyond the realm of the normal “gothic” sound. Creating a timeless blend of Oscar’s emotional vocals intertwined with warm ambient soundscapes. 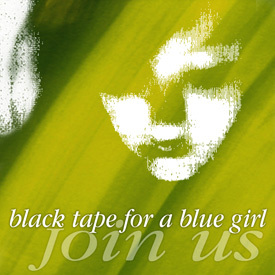 In 1986, Black Tape For A Blue Girl’s darkly mesmerizing debut The Rope appeared on the underground rock scene. It kicked off a rich and diverse musical career for Projekt founder / Blacktape songwriter Sam Rosenthal. 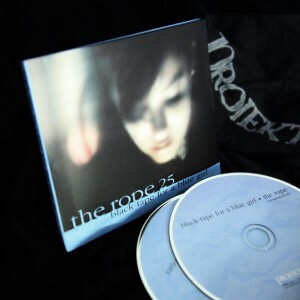 Now 25 years later, Projekt celebrates this momentous anniversary with The Rope 25, a 2-CD set including The Rope re-mastered and a bonus disc of current Projekt artists’ reinterpretations of the material. Eight-page lyrics booklet included while supplies last, so order now! Rosenthal’s electronics coupled with his angst-filled, introspective lyrics established Black Tape For A Blue Girl’s position beyond the traditional “gothic” sound. His lyrics overflow with the emptiness of a shattered soul and broken heart revealing a dark, tortured man scanning the wreckage in search of love, understanding, and connection. The timeless blend of Oscar Herrera’s passionate vocals intertwining with warm electronic soundscapes and soothing ambient passages creates an album similiar to 80’s-era releases on 4AD and Factory Records. Opening the album is the rhythmic, hard-hitting “Memory Uncaring Friend,” along the lines of Peter Murphy or Gang of Four. Following this striking opener, the music takes a more subtle turn: gently disorienting, autumnal, mesmerizing, mournful, full of wonder and elusive grandeur. Upon The Rope‘s release, comparisons were made to Cocteau Twins, Brian Eno, Phillip Glass and Chris & Cosey. the Chipmunks, this might give you an idea of what mental anguish sounds like. It is an experiment worth hearing.” Option Magazine speculated, “The lyrics are of a masochistic nature, which reflects a probable suicide in the writer’s future. Sung by and for those in love with self-misery.” Many of the lyrics (and accompanying stories with the instrumentals) on The Rope dwell upon suicide as a response to a lack of love; an attempt to derive affirmation after the writer had left. “I cared for you more than you ever knew, I do this to show you now.” Oscar sings on the title track. “I see my answer on the end of a rope, the world turned cold for me.” While the final song – “We Return” – looks to others in a similar situation as a solace for the pain and emptiness. “From the black house, we return. Clutching secrets, we must learn.” A glimmer of hope. Other equally innovative reinterpretations include All My Faith Lost’s neo-classical “The Rope,” Mirabilis’ haunting a capella “The Floor Was Hard But Home,” Lux Interna’s neo-folk “We Return,” Attrition’s dark, electronic “Memory, Uncaring Friend,” and Erik Wollo’s electronic/soundtracky “Within These Walls.” A poignant moment is when Walter Holland re-works the original multi-track recording of “Seven Days til Sunrise,” as this track features the clarinet of his late musical partner Richard Watson from the band Amber Route. Hand-picked and sequenced by Rosenthal, this second disc looks back at The Rope while projecting the songs into modern times. TECHNICAL DETAILS, SAM WRITES: The Rope was recorded on a borrowed Fostek cassette porta-studio when I was a college student in Southern California. All the electronics were performed on my Korg Poly61. A Moog Realistic Concertmate MG-1 was used for the leads on “Memory, Uncaring Friend” and “The Few Remaining Threads.” The reason I did not use the Moog on more songs was that it was in Florida at my parent’s house. Those Moog parts were added near the end, when I was back home in Florida for the summer to record Oscar’s vocals.” I have the recollection that “Memory” came together in about three hours; music, lyrics and everything; Allan’s drums and guitar were recorded in his garage in an afternoon, each with a single microphone. Oscar’s vocals were recorded in his living room, while his baby daughter slept (and occasionally cried) upstairs. The Rope was mixed in three hours. Yeah, three hours! Now I spend 20 – 40 hours mixing just one song. I had no idea that I was rushing things! The song “Within These Walls” begins with a sample of drums from the Attrition song “Mind Drop,” so it’s interesting to have Attrition returning the favor with their cover of “Memory” on Disc 2. The Rope was originally released on vinyl, later on cassette and then CD. The original 2-track 1/4″ masters were sent to Canada to get baked and transferred to digital. “Memory, Uncaring Friend” was re-mastered by Al Ursini at Studio Chicago. The rest of the album was mastered here at my studio. Of course there are limitations because the album was recorded on 4-track; often all the music was mashed down to one track, to make room for the vocals and instruments. Re-mastering is a chance to make the album sound a bit more modern as far as the levels go. Yet, as many fans tell me The Rope is their favorite album, I did not do anything to drastically alter the sound. I stayed faithful to the original and cleaned things up, eqed some of the sounds to make them more present, and – just like the listener – re-experienced Black Tape For A Blue Girl of 25 years ago. Sam Rosenthal: moog; Athan Maroulis: vocals; Brian Viglione: drums & electric guitar; Valerie Gentile: electric guitar. Arrangement by Sam & Brian. Recorded & mixed by Sam in the Lush Garden. Drums recorded by Martin Bisi at BC Studios, Gowanus Brooklyn. Mastered by Martin Bowes at The Cage, Coventry, England. Joshua Levi Ian & Kathryn Mary: guitars, hand percussion, loops, voices; Ariela Marcus-Sells: spoken Arabic. “We Return” was recorded in our bedroom onto 4- track, and mastered by Doug White (Watchmen Studios). For those who once gathered in the black house. The Chipmunks, might give you an idea of what mental anguish sounds like. Not the easiest album to listen to, but it is an experiment worth hearing. I feel the room growing dark around me so I’d better write this quickly. The Rope, a project of Projekt’s Sam Rosenthal, make music of a sort more often associated with British artists, specifically those you’d find on labels like Fetish or 4AD. The Rope‘s warmly textured avant-pop plays like a blend of Chris and Cosey and the Cocteau Twins. Black Tape For A Blue Girl is also the best retort I’ve heard lately to the argument that synthesisers are inherently cold and unemotional. Despite the fact that this viewpoint is idiotic on the face of it (translated, it just means that synthesisers are emotive because his music is: gently disorienting, autumnal, mesmerizing, mournful, full of wonder and elusive grandeur. This album culd bring on midnight at noon. The room grows black and the ceiling opens. The sky is awash with sound, So lie back . . . listen . . . and feel. Wow! It’s incredible to have the 25-year anniversary edition of the debut album from this legendary ethereal band. img And if you happen to have the original debut album, then my hat goes off to you as a true fan and still hope you’ll go out and pick up this re-mastered version and it also comes with an excellent bonus disc containing an updated piece as well as others covered by many of our favorite ethereal and ambient projects in the scene. That’s a dozen re-masters of the original album plus a dozen more updated and covered tracks, very cool indeed. I feel slightly uncomfortable reviewing the first disc, the original debut album, it’s something of a classic and a treasure, showing the very raw edges and new collaborative work for Sam Rosenthal and his vocalists and musicians at the time. It’s clear the ambient electronics are the foundation for these early works and how can we miss mentioning Oscar Herrera’s captivating tenor voice. Yes, I know we all have a sweet spot for smooth female vocals in the ethereal genre and Kim Prior lends hers on several on this disc, but not many can compare with the raw emotion and pure beauty of that tenor that we grew to love over the span of several releases from this project. As with most albums, there are several favorites spanning the upbeat to sweet ethereal and including the dreamy ambient soundscapes. Starting off the album is one of the most upbeat tracks from this band “Memory, Uncaring Friend”. The slightly chaotic mix of percussion, bass and guitar all sloshing along for Oscar’s taunting vocals create a rare masterpiece in it’s own light that may have to grow on some while others will savor it from the start. The dark, brooding piece “Within These Walls” also features some subtle early The Cure -like percussion overlain by an eerie mix of electronics, guitar and a duet of Oscar and Kim’s vocals for a moving, yet dreamy jewel that leaves me swooning the more I listen to it, a rare, forgotten gem worthy of resurrecting for all to enjoy. Next comes the dreamy ethereal styles on “End” and “The Rope” which bring out that style that I remember as the most recognizable feature and style of this project. However, right up there with the ethereal beauty are the ambient or otherwise instrumental tracks that are nearly as memorable with each becoming a memorable piece in their own light whether it be the melodic pieces “Seven Days Till Sunrise” and “The Few Remaining Threads” or the ambient, dreamy pieces “The Lingering Flicker” and “Slow Blur”. “We Return” wraps it all up nicely with a haunting mix of vocalists over somber violin and electronics for a somber finale to the album. Disc 2 is a real treat and for long-time fans who may have been enjoying the classic tracks from this album for many years, this becomes the “new” content from this band that’s always exciting. Kicking it off is the latest lineup of artists for this project performing their updated version of “Memory, Uncaring Friend”. Here we get a taste of a slightly edgier version of this song with updated instruments and Athan’s vocals. As the album moves on we’re treated with some real gems, starting off with All My Faith Lost covering “The Rope”. This is a rendition that remains so true to the original mood in so many ways, but is unmistakenly All My Faith Lost with Viola’s heavenly voice backing Federico’s deep, soft vocals for a definite favorite. Mirabilis appears in true-to-form style with mostly accapella version of “The Floor Was Hard But Home”. Several ambient artists provide their dreamy rendition of the related pieces for a very nice take on the originals, memorable and mesmerizing. I think a true favorite and highlight for th album has to be the version of “End” from Rajna. The sheer beauty of this piece almost literally breaks my heart every time I listen to it, dreamy, heavenly music shimmers over simple, beautiful vocals expressing the heart-felt lyrics. It’s hard for anyone to compete with this, but yet this disc remains surprisingly cohesive, even with the inclusion of the up-beat electronic and unique styles of Attrition’s cover of “Memory, Uncaring Friend” which comes together very well and very much only as Martin Bowes and co. could do. Lux Interna provide the final, closing piece with “We Return”, definitely a different take from the original and very down-beat with a somber neo-folk style. Lo scorso novembre la Projekt ha inteso celebrare a dovere i 25 anni dall’uscita del primo album dei Black Tape For A Blue Girl, e questo non soltanto perché – come è noto – il boss dell’etichetta ed il leader della band coincidono nella persona di Sam Rosenthal, quanto piuttosto per la fondamentale importanza che il disco ha rivestito nella storia della musica a tinte scure. Il modo in cui, già nel lontano 1986, il collettivo americano ha saputo far coesistere intrecci vocali ed arrangiamenti sinfonici all’interno di strutture dai profondi umori dark è valso negli anni fiumi di elogi ed un meritato posto nella storia a Rosenthal e soci, nonostante certe imprescindibili gemme di casa 4AD siano sbocciate in precedenza ed abbiano fatto ampiamente scuola. Non ci soffermeremo nuovamente su brani che dovrebbero essere già patrimonio di chi si vuol dire cultore della musica dark, o gothic se preferite: ci limiteremo a fornire il dato importante dell’opera di rimasterizzazione, che conferisce una resa audio decisamente migliorata a momenti destinati a non tramontare mai, ora come fra altri 25 anni. When The Rope was originally released in 1986, gothic rock was in a different place. The realm of alternately gloomy/goofy bands like Bauhaus, the March Violets and Christian Death, the genre dwelt in darkness in the same way as a Bela Lugosi flick: not without its chills ‘n’ thrills, but mostly harmless and a bit silly. But the goth mantle never sat comfortably on Black Tape for a Blue Girl’s furrowed brow. When composer/label owner Sam Rosenthal convened his long-running project for this debut, he wasn’t doing it to make an imaginary soundtrack to his favorite Hammer horror movie – he was exorcising his own pain. Carrying enough angst (mainly over lost love, but disengagement and confusion figure prominently as well) to fill a cement mixer, Rosenthal pours his feelings into the twin vessels of his analog synthesizers and vocalist Oscar Herrara, letting guests add guitar, strings and counterpoint vocals along the way. The result could’ve been an exercise in solipsism so overwhelming that a Sinead O’Connor record would feel impersonal. But, no matter how emo he seems on the surface, Rosenthal is too savvy for that. On brooding tunes like “The Holy Terrors “Within These Walls” and the title track, the mix of chilly electronics and organic instruments finds a balance that pulls the songs from the precipice of melodrama. Using other singers puts distance between him and the expressed sentiments and keeps the proceedings from getting mawkish. Rosenthal also knows when to strategically let air into his hermetically sealed cloud. The handful of ambient instrumentals feel more like the mists of dawn than the fog of darkness, and the opening track “Memory, Uncaring Friend” rocks against the dying of the light despite its downcast libretto. Plus BTFABG ends the record with “We Return,” an assertion that, despite the seeming omniscience of sadness and heartbreak, we “know we will survive.” Rosenthal may spend most of his time in the gloomy end of the pool on The Rope, but he knows when to climb out and find a warm towel. We can wallow in his pain with him, but ultimately we’ll have to switch on the light just as he does. Besides a superb remaster that belies the fact that the LP was recorded on a four-track, this edition includes a second disk of artists from the Projekt roster covering the album’s tunes. The highlight is, unsurprisingly, BTFABG’s own remake of “Memory, Uncaring Friends with Dresden Doll Brian Viglione providing drums and current singer Athan Maroulis improving on the vocal performance. The debut Black Tape album, especially in light of the band’s later efforts, makes for an interesting listen in retrospect. On the one hand, much of what would make Black Tape so distinct is already in place: vocalist Oscar Herrera’s passionate interpretation of Rosenthal’s romantically obsessed lyrics, Rosenthal’s own moody, haunting contributions on keyboards, atmospheric instrumental pieces, and more. “Hide in Yourself,” later featured on the A Teardrop Left Behind compilation, is an especially good example. On the other hand, The Rope is fairly rough and ready in comparison to something like Ashes in the Brittle Air or Remnants of a Deeper Purity, including some of the most explicitly rock-oriented material the group ever recorded. In part this is due to multi-instrumentalist Allan Kraut, who contributes drums, guitar, and bass, or some combination of them, on about half the tracks, along with writing three of the songs with Rosenthal. Also, the sheer depth of later Black Tape music makes the comparatively less full arrangements here sound more like demos. By no means is this criticism, it’s just that those expecting the Black Tape aesthetic to have been fully formed from the start will be initially surprised with The Rope, but will find its charms to be plentiful in the end. Certainly one inspired constant of the band — the use of numerous guest performers on any particular album — pays dividends here. Two violinists, Candy Sherlock and Lara Radford, contribute haunting airs to a number of songs, while clarinet and cello both appear on the lovely instrumental “Seven Days Till Sunrise.” Adam Buhler’s subtle guitar work on “Within These Walls” matches Herrera and Kim Prior’s vocals while nicely offsetting the rough drumming, while on the sweetly beautiful title track, the combination of violin, clarinet, vocals, and electronics is simply, perfectly enchanting.